A cot is available for children up to 3 years. The large canopy bed (160x200cm) and the warm earthy tones create a relaxing atmosphere in this spacious room of 42m2. 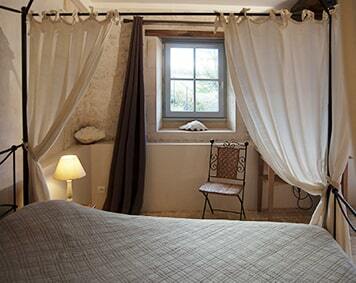 From € 90,– per night for two persons. 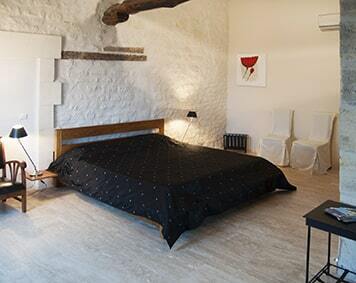 This spacious room (48m2) with sofa bed on the gallery and private entrance accomodates up to 3 guests. Room for two (44m2) in the colors Red and Black with private entrance. Private Terrace with furniture and view over the surrounding vineyards. 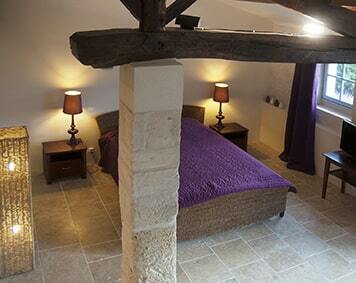 From € 130,– per night for two persons. © 2019 Le Clos des Pierres Blanches. All Rights Reserved.